Our streamlined programs achieve cost-effective, high-volume savings through straightforward industrial and agricultural measures that are too small for the typical custom approach, and that don’t always nicely fit the deemed approach. Many utility programs effectively serve large customers, but struggle to serve smaller customers and smaller projects. This represents not only a missed savings opportunity, but also an underserved customer segment. Can they be served cost-effectively? At Cascade, we’ve cracked the code. The key to making small customers happy and cost-effectively delivering small projects in volume is the combination of right-sized processes with a relentless commitment to vendor and customer success. In the middle of it all sits the customer service engineer—the “jack of all trades” centerpiece of any streamlined program. They wear all the hats, so customers and vendors don’t have to: program marketer, energy engineer, teacher and energy coach, relationship builder and expert communicator, project manager, and on-the-spot problem solver. 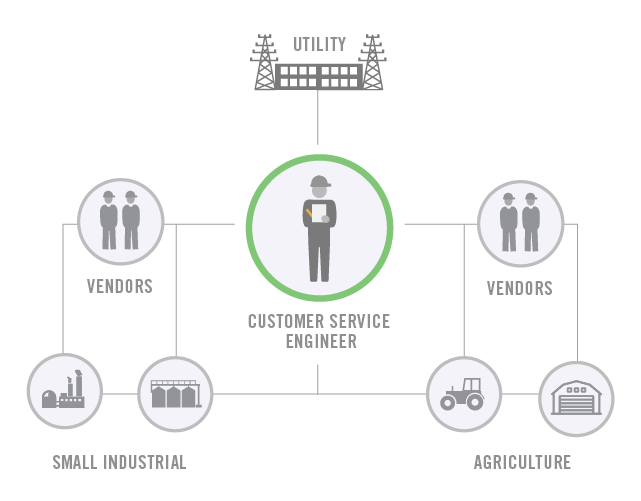 who make the program work efficiently for utilities, customers, and vendors. and grooming them to be an active source of energy-efficiency project leads. measurement and verification appropriately to the size of the project at hand. that streamline calculations and reporting, helping turn projects around quickly. Today we run six streamlined programs across eight states. One streamlined program’s yearly savings. One streamlined program grew its annual small projects count from 30 to 700 over eight years. Ten years ago, one utility came to us with a problem. They saw how many small industrial and ag customers were out there, and how few were actually participating in their program. So, we put our heads together and a new streamlined program was born. The program targets small, repeatable, vendor-delivered projects in the industrial and agricultural sectors, and has helped the utility close the gap in serving its smaller customers. By streamlining program processes and calculations, customers feel their limited time is well used, and are more willing to participate. Since the program started, more than 300 vendors have helped us deliver nearly 4,000 projects. Paul Warila, Cascade’s streamlined industrial program manager, understands the struggles that utilities encounter when it comes to serving smaller industrial and agricultural customers. Since 2007, he has helped design and manage streamlined programs for Bonneville Power Administration, Energy Trust of Oregon, Idaho Power, PacifiCorp, and San Diego Gas & Electric. Cascade can help your smaller industrial and agricultural customers manage their energy use.